Website: Please find more information here. 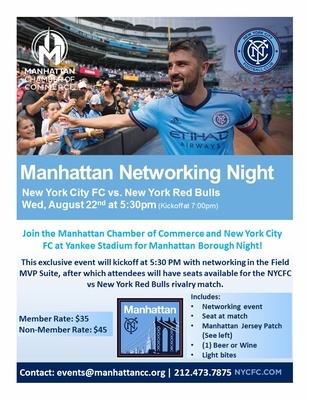 Join our partner the Manhattan Chamber of Commerce and New York City FC at Yankee Stadium. This exclusive event will kickoff at 5:30 PM with networking at the Field MVP Suite, after which attendees will have seats available for the NYCFC vs New York Red Bulls rivalry match, which will kick off at 7:00 PM.